If I’m honest, I could take or leave Pikmin, but this is a revival from Nintendo’s GameCube wilderness years that surprised me by doing that wonderful thing of giving you something you didn’t know you wanted. 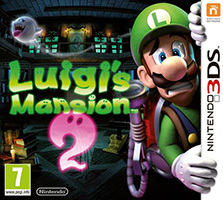 Although it would have been pretty far down my list of desirable Nintendo revivals, Luigi’s Mansion 2 became a showpiece for the hardware, the atmospheric potential of the 3D effect, and the banner release for the Year of Luigi. Only the fact that its qualities can’t sustain it throughout some gratuitous backtracking keeps Luigi’s Mansion from climbing further up this year’s list. But if you take your time, avoiding tiring of going through the same corridor for the fifteenth time, you’ll be rewarded with one of the most charming games around. It’s like the gaming equivalent of a Pixar movie, full of personality, wit and fun little touches. Whereas the original Luigi’s Mansion disappointed as a flagship launch title for a new Nintendo console – it followed Mario 64 there, let’s not forget – I feel like the 3DS would have had a less bumpy debut had it arrived with a game as complementary to the hardware as this game. I loved it, and it’s now my go-to recommendation for new 3DS buyers.